How Do I Teach My Trumpets to Play Higher? Sooner or later all trumpet players have to learn how to play in the upper register. It is the nature of the beast since the trumpet is the soprano of the brass instruments. Many books have been written with the intention of aiding in the development of the upper register, but no single book is the favorite of the masses. While I have had much personal success by applying the techniques taught by James Stamp in his Warm-ups and Studies, I generally practice and teach range through the use of scales, arpeggios and other range development exercises. The great thing about using scales (and arpeggios) is that there is always another one once you have mastered the current one. In my experience as a teacher and player, there is a common misconception about the high register. 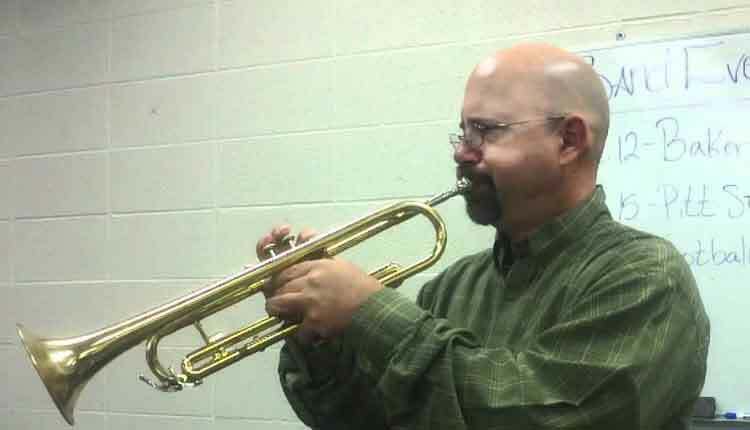 I have heard many teachers tell their students to “blow harder” when the students are struggling to play high, but simply blowing harder will never produce a higher note. Anyone can test my theory. Play (or have a student play) a second-line G, then start to blow harder. Make no other adjustment beyond blowing harder. The result of blowing harder is that the volume grows louder, but the range will not increase. In order to play higher notes, the vibrating surface (in our case the lips) must produce a higher pitch. For the lips to produce a higher pitch they must be tighter in the middle. The very reason a smaller mouthpiece makes playing high easier is that it stretches a section of the lips tighter, which allows them to buzz a higher pitch. In order to play high on the everyday mouthpiece, the player must learn to make the lips tighter. Specifically, tightening the bottom lip will begin to produce the desired effect. Once the lips are tight, it will take a lot of fast-moving air traveling between the lips to set them in motion. This is where the “blow harder” concept comes into play. I generally try to think of blowing “faster” rather than harder, and it seems to help. Also, to aid in moving the air faster, the back of the tongue should be raised, as in saying the vowel sound “EE”. This shrinks the passage through which the air travels in the mouth on its way to the lips, and funnels the air faster. The role of mouthpiece pressure in playing high cannot be ignored. Without a doubt, it takes more mouthpiece pressure to play high than it does to play low. It is harder to use too much mouthpiece pressure than one may think. The problem with mouthpiece pressure is that some of us appear to be using more pressure than others are, when in fact our bodies just react differently due to our individuality. I once heard the world-class trumpeter Chris Gekker say that “it is impossible to use too much mouthpiece pressure. We use as much as it takes. Our bodies just give the audience the impression that we are using too much”. I have since come to believe he is right. Just like some of us have skin that turns red at the slightest touch, some of us have a deeper depression on the lip after playing than others. It’s not that the deeper depression means more pressure was used, but simply that that person’s skin or lip tissue reacts differently to the pressure of the mouthpiece rim.